O’PATI is an elegant streamlined 130-foot mega yacht that was launched in 2011 by the Golden Yachts shipyard and whose interior was meticulously designed by the Italian Studio Giorgio Vafiadis. 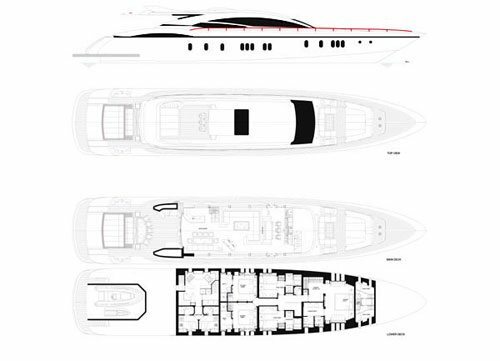 This high-performance yacht exudes chic and style without compromise to comfort and stability. With a cruising speed of 24 knots, this sumptuous yacht will take you on an irreproachable adventure through warm and translucent waters of the Mediterranean! Luxury mega yacht O’PATI is a glamorous construction with a crew of 7 ready to yield to passengers’ every request as they take advantage of the top-notch entourage of this stylish yacht. With an imposing and glistening black hull and a sophisticated grey superstructure, luxury mega yacht O’PATI is en epitome of elegance inside and outside. Interior spaces aboard luxury mega yacht O’PATI feature elegant rich paneling as well as soft cream, brown and grey upholstery creating a posh yet tranquilizing and harmonious space. The vast main deck salon and dining room are a perfect backdrop for lounging and entertaining alike and their designer touches are the cherry on top of this polished space. A plush oversize sofa in this sunlit area with large panoramic windows beckons for pleasant idle moments in front of the 46’’ plasma TV or with a book in your hand. The crew will readily prepare a fresh cocktail in the adjoining fully-equipped bar for a quiet evening or a more lively gathering. The dining room boasts a comfortable table and a convenient seating arrangement either on the plush settee or chairs. Accommodation is provided for up to 12 guests in 5 beautifully appointed ensuite cabins including three double and two twin cabins with an additional Pullman option in the latter. The full-beam master compartment with a walk-around king bed features polished-wood furnishings, a large walk-in wardrobe, a private settee, large windows, plenty of storage, a home cinema and an exquisite ensuite bathroom with dual sinks and deluxe amenities. The pilothouse aboard O’PATI is impeccable for pouring over the maps or chatting with the Captain about worthwhile excursions, local specialties, the most recommended water toys or impeccable sandy beaches for soaking up the sun. Exterior space aboard luxury charter yacht O’PATI is equally as impressive with a vast lounging area on one of the decks or the flybridge. The fore deck lures passengers with plush oversize sun pads for exquisite sunbathing or absorbing the breathtaking surrounding while the flybridge features an external helm station and white leather seating. The aft deck boats a large alfresco dining table and sophisticated grey mattresses, yet another option for relaxing in the warm sun rays. The sun deck calls for languid basking on the plush grey sofas or for a intimate cocktail party under the setting sun. All adventure-seekers will be in awe of the amazing water toys available aboard luxury charter mega yacht O’PATI with tenders, a waverunner, a water skis, wakeboards, tubes as well as snorkeling and fishing equipment. The swimming platform offers direct access to the refreshing sparkling waters of the Mediterranean, whether you are passing your luxury charter vacation in the French Riviera, the Italian Riviera, Greece, Turkey, Croatia or Montenegro. Charter luxury mega yacht O’PATI for an unforgettable experience in the sun that is sure to leave you with memories to cherish for a lifetime.